Since last I blogged, my mom has started eating gluten-free. That means I’ve gotten lots of questions (which is great!) and a few requests for recipes. She’s pretty good at letting Google be her guide. But, being the good mom that she is, she usually checks here to see if I’ve come up with something first. The last time I visited, she’d made a pie crust that we all agreed was less than spectacular. 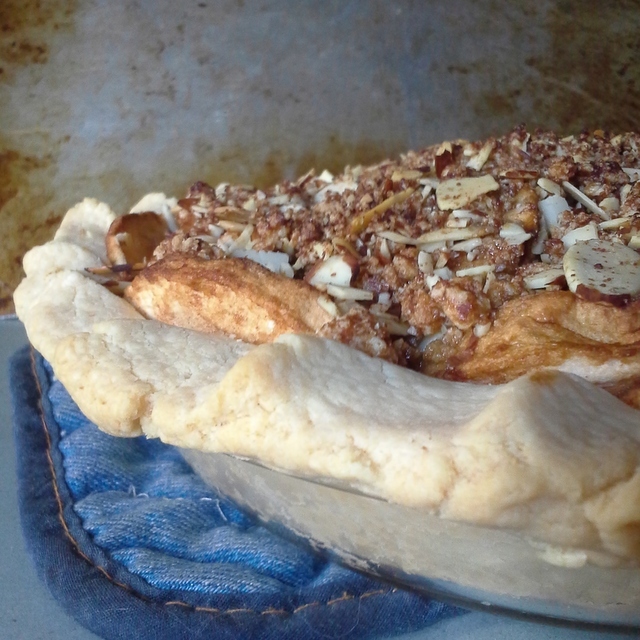 I realized that while I’ve certainly made a lot of pies, I hadn’t ever blogged a crust recipe. So, without further ado, here’s my basic crust recipe. Put the shortening, flours, salt and xanthan in a food processor (or bowl if you don’t have a food processor). Pulse the food processor (or cut with a pastry cutter) until the shortening is well distributed. Add the egg and the 2 T. ice water and pulse until the dough forms a ball. (If doing this by hand, stir until the dough comes together.) The dough will feel just a little too wet/sticky. This is the way it is supposed to be. Roll the dough out between 2 sheets of parchment paper and transfer to pie pan. Trim the edges, and then pinch them to make a decorative edge. If you’re blind baking, bake at 350° until lightly browned. If you’re using as part of a pie, continue with the pie recipe as directed. This recipe makes enough for 1 single-crust deep dish 9″ pie, or enough for an 8″ pie with a streusel topping (like the photo). To make the streusel, put the scraps from the bottom crust back in the food processor and pulse with 1/4 cup coconut sugar and 1/2 cup sliced almonds. This entry was posted in desserts and tagged pie, recipes. Bookmark the permalink. Thanks Shirley. I love the combo of almond, white rice and tapioca flour. I use it all the time. A pie round-up would be great for fall. The holidays coming up always make me think of pie. I usually use Tropical Traditions or sometimes Spectrum shortening. Thanks, Deanna, both for the shortening recommendation and the validation on the pie crust roundup idea! I have TT palm shortening on hand and love it and I’m with you on pies for sure. Pie crusts tend to be a challenge for many who are gluten free so having a listing where folks can find one that works perfectly for their individual needs will be great! I just love all your recipes! Thanks for gluten free recipes! We have nut allergies in our house. What can I sub for the almond flour? Thanks! !